American Sloughgrass (Beckmannia syzigachne) is a monocot weed in the Poaceae family. 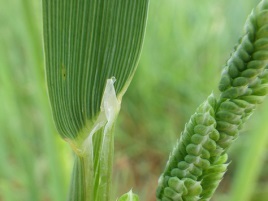 In Japan this weed first evolved resistance to Group K1/3 herbicides in 2010 and infests Spring Barley, and Wheat. Group K1/3 herbicides are known as Microtubule inhibitors (Microtubule assembly inhibition). Research has shown that these particular biotypes are resistant to trifluralin and they may be cross-resistant to other Group K1/3 herbicides. Greenhouse, and Laboratory trials comparing a known susceptible American Sloughgrass biotype with this American Sloughgrass biotype have been used to confirm resistance. For further information on the tests conducted please contact the local weed scientists that provided this information. There is no record of differences in fitness or competitiveness of these resistant biotypes when compared to that of normal susceptible biotypes. If you have any information pertaining to the fitness of Group K1/3 resistant American Sloughgrass from Japan please update the database. The Herbicide Resistance Action Committee, The Weed Science Society of America, and weed scientists in Japan have been instrumental in providing you this information. Particular thanks is given to Satoshi Iwakami, Tohru Tominaga, and Akira Uchino for providing detailed information. Li YiWei ; Chen YiFeng ; Li YongFeng ; Tang RiSheng ; Mei ChuanSheng. 1997. Inductive resistance to chlorsulfuron in Beckmannia syzigachne and Alopecurus japonicum in vitro. Jiangsu Journal of Agricultural Sciences 13 : 85 - 89. In vitro experiments were conducted to study the characteristics of induced resistance to chlorsulfuron in subcultures of Beckmannia syzigachne and Alopecurus japonicum young-panicle callus tissue. Results indicated that the sensitivity of acetolactate synthase (ALS) decreased in both the weed species with increasing chlorsulfuron concentration. The IC50 (the concentration causing 50% inhibition) of ALS activity increased from 1 to 300 µg/litre for 6-12 subcultures of B. syzigachne and from 1 to 100 µg for 4-10 subcultures of A. japonicum. Induced resistance was also observed in regenerated plantlets of B. syzigachne; resistant plantlets from subcultures exposed to high levels of chlorsulfuron suffered less inhibition of growth when exposed to 200 µg and fewer died when exposed to 1000 µg than did those regenerated from subcultures with a history of lower level chlorsulfuron exposure. Callus growth and differentiation, and plantlet development in B. syzigachne were unaffected by chlorsulfuron during subculturing..